The USTA Texas Section Senior Women's 3.5 team. The "Happy Feet" Shirt worn by the Texas women's team. Close up detail of the "Happy Feet" Shirt worn by the Texas women's team. INDIAN WELLS, Calif. – In the 12 years that Dallas resident Edna Ground has been captain of the USTA Texas Section Senior Women’s 3.5 team, she has told her teammates to have "Happy Feet" as a way to motivate them to keep moving on the tennis court. That advice finally paid off this year as her senior women’s 3.5 team advanced to the USTA Senior 3.5 League National Championships for the very first time. When asked about the "Happy Feet," Ground, a Dallas resident who is still active in a family business, said, "That’s been my motto for 12 years to get the girls to move their feet on the court. I sign all of my emails, ‘Happy Feet – Keep Moving.’"
Taking her "Happy Feet" motto to heart, Ground had each member of her team wear a jeweled pin in the shape of two feet when they played in the USTA/Texas Senior Ladies 3.5 Section Championship last month in Tyler, Texas. When the team, which represents the Brookhaven Country Club in Dallas, arrived in Indian Wells for the Nationals, they came dressed to impress. They wore a specially designed shirt to the Official Player Party held on Thursday night at the Miramonte Resort & Spa. 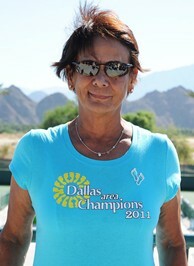 The teal-colored shirt read "Dallas area Champions 2011" and had a circular logo, which were pairs of feet. Each team member also wore their "Happy Feet" jeweled pin. "We came up with the idea and our shirts were designed by one of the girls on the team," Ground said. After the design was completed, a team member’s son made the shirts. While her "Happy Feet" motto helped the team to keep moving on the court, Ground said they also had a little luck in getting to the Nationals for the first time. "When we went to Sectionals, they told us there was luck involved and there was," Ground said as she explained that her team received a good draw at the Texas Sectional Tournament. "I think it was probably just the draw that we were in. Maybe we were able to play those players stronger than in other draws," she added. In her 12 years as team captain, Ground had led her team to the Sectionals on several occasions, but always fell short of reaching the Nationals. "We tried hard every year and we didn’t make it, so it was an honor to make it to Sectionals and it’ really a big honor to make it all the way to Nationals," Ground said. "It feels good to be here finally. We were on two different flights, but everybody all got here," Ground said after arriving in Indian Wells. "We practiced (Thursday) afternoon and we’re ready." The Texas Section Senior Women’s 3.5 team is playing in Flight 3 at this weekend’s League Nationals. They will compete with Hawaii, Southern and Intermountain Sectional teams for a spot in Sunday’s semifinals.